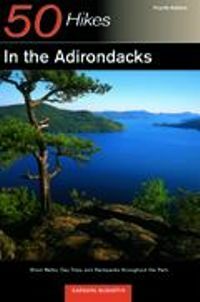 50 Hikes in the Adirondacks, by Barbara McMartin. 4th Edition, 2003. A varied sampling of hikes for all tastes across the great 6,000,000 acre Adirondack Park, written by a hiker who knew it better than anyone. Includes popular High Peaks treks, but many out-of-the-way trips too. Revised 4th edition includes several new hikes. Topo map included for each hike. 258 pp, 6” x 9”.